Okra is a green vegetable grown in South America, the West Indies, and India. Not only is it delicious, but also is filled with nutrients and with many health benefits. 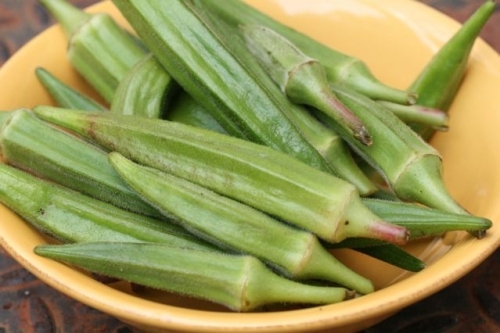 It naturally decleanses toxins from the body.A delicious, roasted okra dish! 2. Line cookie sheet with aluminum foil and brush with melted butter. 3. Place the slices of okra on the cookie sheet. 4. Mix the salt, pepper, and garlic powder in a small bowl. 5. Drizzle the okra with olive oil and then sprinkle with the mixed seasoning. 6. Bake for 15 minutes, serve, and enjoy! There are many different methods of how to cook okra, but this roasted dish is one of the best! This healthy okra dish goes along great with chicken breast and a side of rice.